Do you like to read? There are two upcoming, amazing reading programs happening soon. They are Read Woke, and Read Brave. Read Woke is going to be for high schools, and Read Brave is city wide. Here is some information on these two reading programs. The Read Woke program started in Georgia, where a high school librarian started it as a response to what the country was going through at the time. The basic idea, of the whole thing, is to read books about other people that have different experiences than you. When we read books about different people, (i.e. different race, gender, sexual orientation) we learn more about them, and that’s an important part about the program. The idea is to make people who read the books more “woke” to what others see and experience. The current SPPS schools that are participating in this program are: Highland, Johnson, Harding, and Creative Arts. There are a total of 12 different books that are pretty similar in that they all deal with issues the country is facing right now, some are new, and others are old. The books were all chosen for a reason; to challenge stereotypes about people. There will be 5 copies, of each book, available in the library at Highland. For anyone who reads 4 of the books, with a written review of 1 of them, they will be rewarded with a shirt. The review will be online so that students can see what students from other schools thought of each book. Read Woke will be promoted in English classes at Highland by Ms. Rahman, the librarian. The start date is on the 29th of October, and it is a yearlong program. 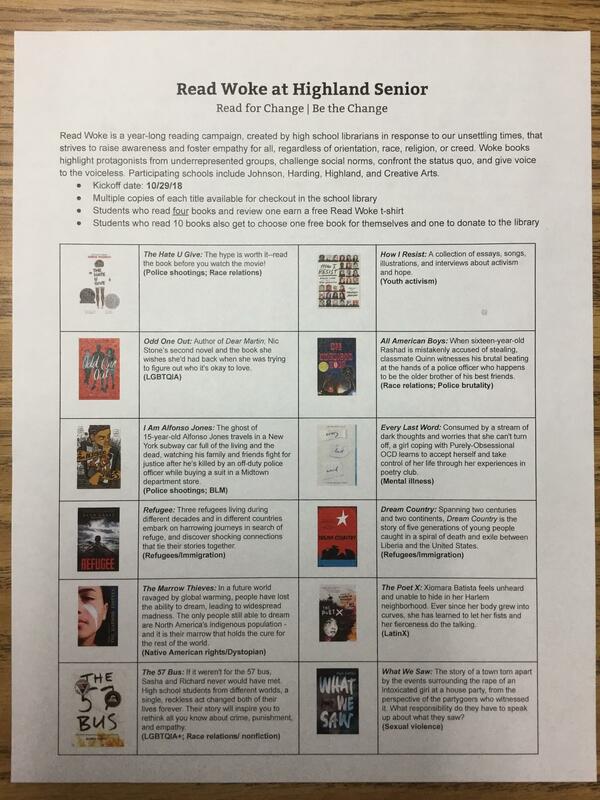 If a student reads 10 of the 12 Read Woke books, the librarian will buy any book of their choice for them, plus she will also buy a copy to put into the school library. Read Brave is a bit different because it is a city wide reading program, and it will be hosted by St. Paul College. The idea for Read Brave is to bring up issues that teens are going through. Read Brave will be focused on mostly one book, but there are other options available. The reason for this is that they want teens and adults to read the same book. St. Paul College will purchase copies of the book for participating schools and libraries. After the program ends (end of February), the author will come to St. Paul, and speak at different schools, and will also hold community events. Students then have a chance to talk to the author and learn more about the book through these events. The book for Read Brave this year is, Burn, Baby Burn by Meg Medina. This book focuses on a teen that experiences housing problems. St. Paul College, felt that this was a topic worth learning more about. There will be another option for adults if they choose to read a different book, Evicted by Matthew Desmond. The Mayor is also getting involved with the Read Brave program to try and promote it more. These are the two reading programs that will be taking place soon. Students who are interested can stop by the library, and talk to Ms. Rahman to get more information.